Les Nessman (Richard Sanders) broadcasts from WKRP's Thanksgiving promotion at fictional Pinedale Shopping Mall on Oct. 30, 1978. As God as my witness: WKRP bombed a Cincinnati shopping mall with live turkeys 40 years ago today, on the hilarious WKRP in Cincinnati "Turkey's Away" episode Oct. 30, 1978. The fowl promotion was just the seventh episode of WKRP, which premiered on Sept. 18, 1978. "Turkey's Away" ranked No. 40 on TV Guide's "100 Greatest (TV) Episodes of All Time" in 1997. Johnny Fever (Howard Hesseman) told listeners during news director Les Nessman's live remote: "For those of you who just tuned in, the Pinedale Shopping Mall has just been bombed with live turkeys! Film at 11!" The stars of 'WKRP' (front row) Loni Anderson, Howard Hesseman, Jan Smithers, (middle row) Herb Tarlek, Gary Sandy, (back row) Richard Sanders, Gordon Jump and Tim Reid. Station manager Arthur "The Big Guy" Carlson (Dayton native Gordon Jump) promised that he was "going to make history" with "the greatest promotional idea of all time." He concocted the scheme with Nessman (Richard Sanders) and sales manager Herb Tarlek (Frank Bonner). So Johnny Fever, Venus Flytrap (Tim Reid), program director Andy Travis (Gary Sandy) and producer Bailey Quarters (Jan Smithers) didn't know what to expect when Nessman began his live remote from outside a shoe store. "Something just came out of the back of the helicopter. It's a dark object. Perhaps a skydiver. A second. A third ... No parachute yet. ... Oh my God! They're turkeys!" Nessman reports. "They're crashing to the earth right in front of our eyes! One just went through the windshield of a parked car! This is terrible! ... Oh, the humanity! The turkeys are hitting the ground like sacks of wet cement! The crowd is running for their lives!" When Carlson returned to the station, he tells the staff: "I thought it would work. I planned it right down to the last detail. It was perfect! ... As God is my witness, I thought turkeys could fly." The "turkey drop" show was such an iconic cultural phenomenon that Sanders re-created the stunt for years for radio stations by dropping gift certificates or other items from a chopper over shopping centers, including at old Forest Fair Mall in 1990. WKRP aired four seasons on CBS (1978-82). Hugh Wilson, the former Atlanta advertising executive who created WKRP based on a station in that city, said an Atlanta radio station (WQXI) manager named Jerry Blum had told him about his turkey promotion at a Dallas station in the 1950s. "He told me that he had been fired from a Texas station for throwing turkeys out of a helicopter. I said to him, 'Jerry, you just won me an Emmy! That's really funny!' " Wilson said in an oral history co-produced by the Archive of American Television and the Writers Guild Foundation. (WKRP was nominated for 10 Emmys, including three times as the Outstand Comedy Series. It won only once, for Andy Ackerman's Outstanding Video Tape Editing in 1981.) Wilson died in January at age 74. Forty years later, I still think it’s the funniest half-hour of television ever produced. As God as my witness. 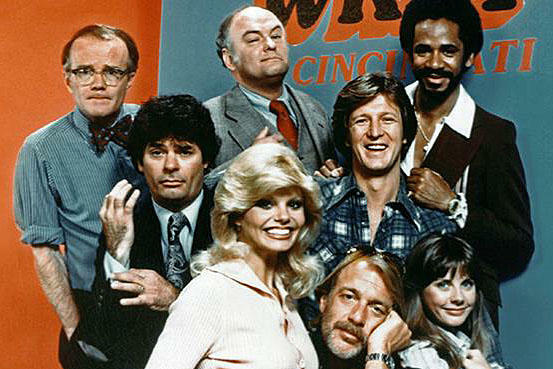 WKRP in Cincinnati airs 9:30 p.m. weeknights nationwide on MeTV. Tonight it's scheduled to air an episode from March 1981, and not "Turkey's Away!" MeTV is available in Greater Cincinnati over-the-air on WLWT-TV (Channel 5.2), and on Cincinnati Bell Fioptics (Channels 23 and 291), DISH network (Channel 247) and Spectrum cable in Southwestern Ohio (Channel 993) and Northern Kentucky (Channel 188). In the Dayton area, it's available on over-the-air WHIO-TV (Channel 7.2), Spectrum cable (Channels 23 and 372), AT&T U-Verse (Channels 136 and 1136), Buckland Telephone Company (Channel 11), NK Telco, Inc. (Channel 6), TSC Television (Channel 777) and Wabash Mutual Telephone Company (Channel 6). Hugh Wilson, who created "WKRP In Cincinnati" without visiting the Queen City, died Sunday, Jan. 14, at his Virginia home. He was 74.